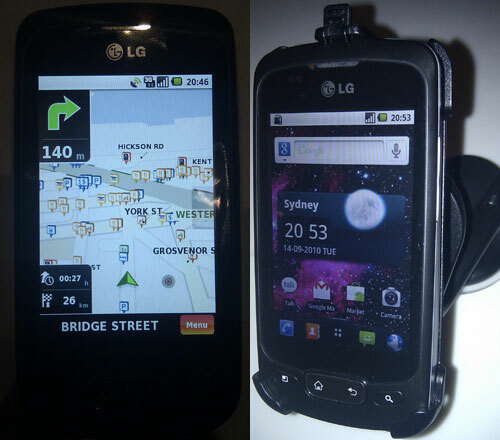 LG launched Optimus One Android 2.2 smartphone in Australia for $349 RRP outright through Optus stores with a great value for money GPS Kit bundle including NDrive GPS application using Navteq maps, windshield mount and a car charger cable (extra value worth around $99). You can get it from Optus online for $309 or Virgin Mobile plans $24 and up. I tested a loan revew unit from LG for a few weeks and found that while the LG Optimus One phone hardware (600mhz CPU, 3MP camera, 3.2″ 320×480 screen) isn’t as advanced as the industry leader HTC Desire and Samsung Galaxy S Android phones, LG makes up for this by shipping with the latest version of Android 2.2, costing less than half the price of those phones and including the GPS car kit. Apart from the camera which is a disappointing 3Mp with no flash the LG Optimus One is just as good as the original wave of android phones released by HTC a year ago and a half ago but with the key benefits of running the latest 2.2 version of Android (which includes wifi hotspot capability), bundled free Swype software keyboard and at just over $300 costing less than half what the HTC Dream and HTC Magic cost when they were released..
LG traditionally sells *a lot* of cheap basic mobile phones and isn’t known for innovative smartphones. The launch of the LG Optimus One shows that they’re serious about bringing the cost of smartphones with mid-range hardware down to a level at which they’re affordable for prepaid mobile users to buy outright or get on a cheap monthly plan. At present Optus is selling the LG Optimus One online for $309+postage and it’s subsidiary Vigin Mobile are selling it with plans from $24/month and above. Compared to the HTC Wildfire which sells for a similar price the LG Optimus One has a better bundle and bigger screen resolution (can display twice as much information) so it’s the clear choice at the moment for Australians who want to buy a value for money Android smartphone. EDIT: Avoid the original LG Optimus model phone because it had really cheap hardware with a poor quality Resistive touchscreen. Make sure the phone you buy is clearly the “Optimus One” model. EDIT 2: When LG was questioned about the possibility of an LG Android tablet at the press conference I attended they strongly hinted that they wouldn’t launch a tablet product until a new version of Android is released which specifically supports Tablets. Android: Latest version 2.2 (Froyo). Most Android phones sold in Australia still only run Android 2.1. Android 2.2 is faster, allows apps to be installed to external SD storage, sync with Outlook Calendar or create a portable Wi-Fi hotspot using the phone’s data connection. Bundled GPS Car Kit includes NDrive GPS App worth $AUS82 including onboard Navteq maps for Australia and NZ with map updates for the life of the phone hardware as well as a windshield mount and a car charger cable (total value around $99). Since the NDrive GPS App uses maps stored on the phone it doesn’t need a mobile phone signal to use which is quite handy. CPU: Qualcomm 600mhz. Similar benchmark speed score to a HTC Desire running Android 2.1 because Android 2.2 is more speedy. Camera: 3 megapixels. No flash. Records video H/264 / MPEG4 VGA @ 18fps. Wow this phones are amazing! Technology rocks! and we’ve all had the same problem with the touch screen element,after a couple of months it doesn’t work properly and navigating through the phone and sending text’s becomes a long drawn out affair! this phone is not out yet,optus $349.00? where. wow, is this seriously already released? i heard that this one is running on a windows phone 7 OS with a media sharing over wifi. i am not sure if this is the one but if this is the new released, then this is it. definitely one of the phone that can at least enhance the people experience using android system. i believe this OS system is available on some android tablet system already such as samsung galaxy which is going to be released and also the witstech a81e which is the cheapest one among the latest android tablets. i heard alot of storys of people who had an Apple phone and then wanted to try the Andriod and found that they would consider the switch more beneficail to them becasue the the driod gave them more freedom to customize through a vastful of applications. Well thats through from experiance from co-workers and friends. I my self carry an andriod and i love it, but i am curious to experiance an apple !